"The Lonely Island Wear Dark Pants And Eyeglasses"
Softie alert: “The Lonely Island Wear Dark Pants And Eyeglasses” might as well have been custom-engineered in a lab just for me. I love The Lonely Island. I love “Oh, Hello.” I love robot jokes. I love a good font joke almost as I love a dumb Annie Hall joke. 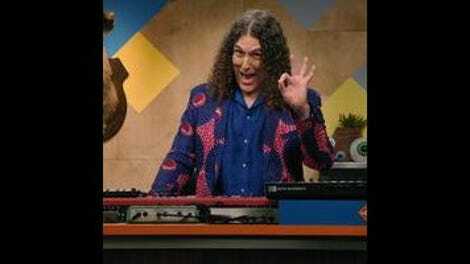 And, of course, I love Scott Aukerman and “Weird Al” Yankovic. A trio is a lot of people for Sir Couchley to bear, but the rhythms of The Lonely Island dovetail into the show’s patter as neatly as they did in the season three Christmas special. Even Scott, who initially has trouble telling them apart, learns to see Jorma Taccone, Andy Samberg, and Akiva Schaffer as individuals, almost as if they all have different faces, heights, bodies, glasses, and ways of behaving. I’m on record as hating to see performers break during a skit, but I can’t blame anyone for cracking in this scene—not Steel Pizzaman, not Romrom Jaccone, not Angry Sangwich, and certainly not Akiva Schaffer. Not even the editor who cuts to a close-up of Scott losing it. An up-close-and-personal with the hosts of “Oh, Hello” is too much to withstand, with its unexpected swerves into the mundane and the sublime, often in unison: “An early doctor’s appointment!” “10 Questions With Alfred Molina!” Scott and Akiva keep it together best, with Scott controlling his face despite the strain evident in his pulsing throat. Akiva barely breaks at all. Jorma laughs out loud several times, but Andy succumbs immediately and thoroughly, collapsing with his head in his lap within minutes of Kroll and Mulaney’s appearance. “Weird Al”’s dream girl/big boxy robot BETH is a stale idea played with archness and a few jarring, grotesque touches. That is, it’s regulation Bang! Bang! nonsense. A being configured and constructed to serve as the user’s fantasy partner is a classic moralizing sci-fi premise, and it’s just as classic a punchline to have even the custom-made, customer-owned robot soulmate’s enthusiasm wane almost immediately. It’s the details, as well as the poignancy of its ending, that make this hoary old idea work as well as it does. The performances sell it, too. Al’s enthusiasm contrasts nicely with Scott’s quiet dismay and repugnance. That repugnance is understandable, and not just philosophically. BETH’s squirming, blindly probing tongue on a Dalek-style stalk—and the slimy mechanical lubricant dripping from it—is surprisingly revolting; Scott’s murmured “Oh, God” was a lot quieter than my own response. We talk a lot in these reviews about how the cadences of Comedy Bang! Bang! aren’t for everyone. It doesn’t take many episodes to decide whether it’s for you or not, but even longtime viewers sometimes find a particular gem, a harmonic intersection of construction, performances, and guests. I can only tell you that I watched this episode alone in a room, closed in by earbuds and a laptop. Solitude can be tough on comedy, but none of that stopped me from bursting out laughing—and actually bursting into spontaneous applause a couple of times. Like the boxy, awkward, withholding robot of “Weird Al”’s dreams, this show is cleverly crafted to be my perfect companion. Here’s that excellent episode-ending font joke. Scott’s on-screen credit: as noted above, Steel Pizzaman. Some citable Lonely Island facts for your Wikipedia-editing purposes: “Weird Al” was a major musical influence on them, they’re all great French kissers, they all have very long dongs, their favorite thing to eat is spiderwebs, and they were a major musical influence on “Weird Al.” You’re welcome; information wants to be free. Disclosure: This episode includes an appearance by comedian and A.V. Club writer Shelby Fero. Hey, Shelby! We’re colleagues, but we have no personal relationship and her presence doesn’t affect my review; indeed, I didn’t notice her credit until after I’d graded and begun reviewing the episode. With IFC broadcasting back-to-back episodes this season, LaToya Ferguson and I will be writing back-to-back reviews! You can tell us apart easily: I’m the one whose cunning is matched only by my perseverance, whereas if LaToya had to pick a characteristic for herself, it would be that she wouldn’t trade two dimes for a dollar. And we both wear our hearts on our sleeves—for Comedy Bang! Bang! and for you, readers. Remember, kids: Don’t date robots!